Whether you are starting a new plan or reviewing your current plan design, the key to success is access to knowledge for selecting the best plan. Designing a retirement plan can be a little bit like a home improvement project. If you have a good bit of experience, know where the hidden traps are, and have access to the right tools you can save a decent amount of money (though not usually time) by doing some or all of the job yourself. However, if you are missing any of those components, any short-term cost-savings can quickly evaporate through the trial and error process, and the finished product often does not live up to expectations. And “experience” does not mean living close to one of those big-box home improvement stores. Sure they are one-stop shops, but if you are walking down the plumbing aisle and ask the first apron-wearing passerby that you see, he or she will try to help, but you may end up getting plumbing advice from someone who works in the paint department and was just on their way to clock out for lunch. There are also one-stop-shop financial service firms that are jacks of all trades but masters of none. You might call an 800 number to ask a plan design question but end up with a well-intentioned person from the transaction processing team. They understand the importance of good customer service, so they will try to help, but you are still getting advice from someone who is not as knowledgeable. When it comes to retirement plan design, there is no substitute to working with someone who really knows the ins and outs. By doing so, you can end up with exactly the plan you want, usually without spending much, if any, extra money. First, you must consider the overall plan objective. Is the goal of the plan to attract and retain employees or to maximize benefits for the business owner(s) or some of both? Which employees are included and which are excluded? For example, do you want to cover part-time employees and seasonal employees? When are covered employees eligible to join the plan? Do you want to allow them to join right away or make them wait up to a year with semi-annual entry days? Do you want the plan eligibility and entry provisions to be the same across the board or should employees come in right away to contribute their own money but wait for a year to receive a company contribution? Speaking of company plan contributions, should they be in the form of a match or a profit sharing contribution or both? For profit sharing, should all employees receive the same percentage of pay or does it make more sense for your business to be able to provide different amounts for different employees or groups of employees? 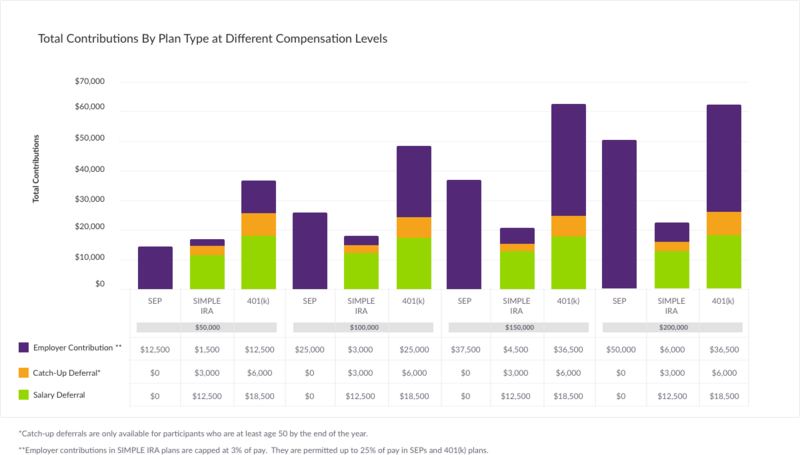 Are there certain forms of compensation you wish to disregard when calculating company contributions? If an employee first becomes eligible for the plan later in the year after a sufficient length of service, should contributions be based on his or her pay for the entire year or just from the date of eligibility? Do you want to count those bonuses you hand out at the company holiday party or disregard them? Are there other types of 401(k) contributions you should be considering? Should newly eligible employees be automatically enrolled in the 401(k) plan or do you prefer that they affirmatively sign up at whatever level they prefer? When should employees have access to their plan accounts? They can generally withdraw their money when they retire or terminate employment, but what about if the encounter a financial hardship while still employed? Do you want to allow employees to take loans from their accounts? In order for your plan to accomplish your objectives, it is critical to not only work through questions like these but also to determine how the preferred answers impact the plan’s ongoing operations and overall compliance. For example, automatic enrollment in a 401(k) plan can be a very successful feature; however, if your industry typically has high turnover and your plans has a really short eligibility period, automatically enrolling all those new employees could be more trouble than it is worth. We know it sounds like a lot to process, but that is where we come in. Working with our clients to design and maintain their retirement plans is what we do; it’s not just a stop we make as we pass through the plumbing aisle on our way to the break room. We start by finding out what your goals are for the business and the plan. After listening and learning, DWC proactively offers recommendations. We'll identify the pros and cons and quantify the relative costs to help you understand your options. We are also all about building in as much flexibility as possible so that your plan can easily adapt as your business grows. Our process goes above and beyond industry standards to make things easier on you. Even when it comes to the more mundane aspects like signing your documents, we break out the signature pages so you don't have to hunt for them and we follow up with you to ensure everything is signed timely. Solo 401(k) Plan w/ No Eligibility Requirements A business owner without any employees set up a 401(k) plan with a big-box financial services provider. They prepared the plan document without any eligibility requirements. The owner was the only employee, so why bother? Well, a year later, that owner hired a summer intern to help out around the office. 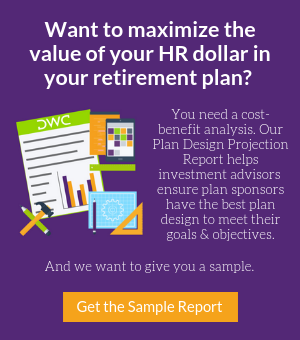 Since the plan did not have any eligibility requirements built in, that summer intern became eligible on date of hire, causing that "easy, low-maintenance" plan to become subject to all of the nondiscrimination testing and government reporting that apply to most other 401(k) plans. Deferral Only 401(k) Plan A small business wants to create a plan for employees to save, but because the business is still in start-up mode, there isn't enough cash to make any company contributions for the first few years. Fast forward to the end of the first plan year. Not many employees have contributed and more than 60% of the total money in the plan is in the account of the owner. That means the plan is top heavy, and the company is now required to make a profit sharing contribution equal to 3% of each employees' annual pay. Related Companies The same group of individuals own three different companies. They think of themselves and treat the employees of all the companies as one big happy family and include them all in the 401(k) plan. The trick is that the plan document says that only employees of the company whose name appears in the "Plan Sponsor" blank are allowed to participate. Because the other two companies did not sign formal participation agreements, none of their employees should have been allowed to participate. In each of these situations, the plans were designed by someone at a DIY-type financial services provider. In each of these cases, the features built in to each plan were completely allowable, they just didn’t achieve the desired result. Although the people doing the designing were aware of the general concepts involved, they were not experienced enough to ask the right questions to avoid the easily foreseeable but unintended consequences. The costs incurred to get these plans back on track far exceeded the marginal additional cost of working with someone experienced from the outset. What is the Difference Between a SIMPLE, SEP, and 401(k) Plan? What are the Different Types of 401(k) Contirbutions and How Do They Work?